At first glance I know you're all gonna think I took this picture at RW or Timmy C's house when we were in Lincoln, NE. Well it was actually at one of my customers house. I don't know what the story is on it as they weren't home at the time. It just conjures up a lot of strange thoughts. Doesn't look too safe or useful but I'm sure they had some fun with it. Re: Ever seen one of these? CHICAGO — A small town police department in Minnesota will put a motorized lounge chair up for auction next week after it was seized in a drunk driving incident. The black and blue pleather lounge chair comes complete with stereo, footrest, cupholders, headlights, a nitrous oxide power boost system, drag racing-style steering wheel and a parachute. 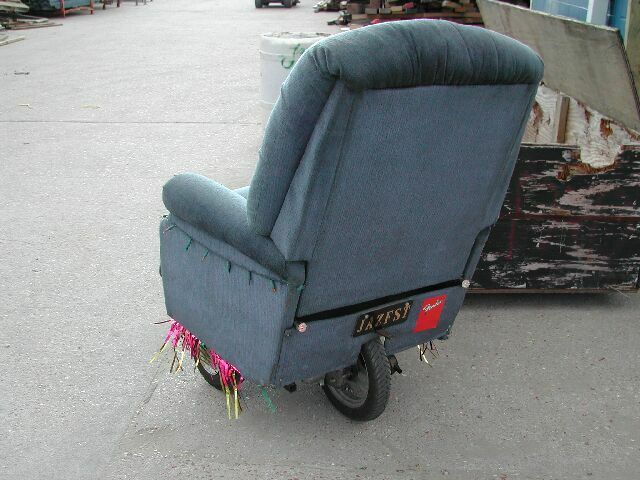 Built on top of a riding lawnmower engine, the chair is decorated with stickers proclaiming "hell yeah it's fast" and "I smoked your (expletive)," and can get up to speeds of around 15 miles (24 kilometers) per hour. It was seized on August 31, 2008 after Dennis LeRoy Anderson, 62, smashed it into a parked car on his way back from a local bar in Proctor, Minnesota. Anderson told police the only reason he hit the car was because a girl jumped up on the chair. I think you are supposed to stand on the stool on one foot while steering with the other. You never seen a riding mower before? What's wrong with y'all. That there is a riding lawn mower. MFT1080 & MFT/3, TS55, CT22, OF 1400, OF 1000, ETS 150/5, Domino, RO 150 FEQ. Something for the man on the go. No, wait, the seat is down.